Developed by students as an alternative to CAESAR, Courseseek allows users to create a tentative schedule and view potential conflicts prior to class registration. As preregistration for Fall Quarter classes begins, a group of Northwestern students is trying to make the process faster and easier. Seven students teamed up to create a website called “Courseseek” that addresses some of the flaws of the University’s course registration system, CAESAR. Courseseek went live May 13 and has had 2,133 unique visitors thus far, according to the students who created it. 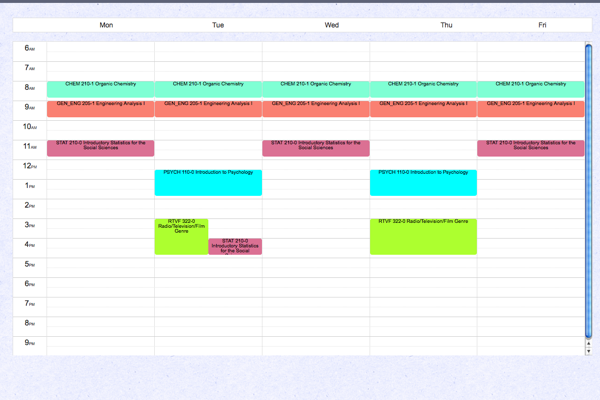 Courseseek has a calendar feature, something CAESAR lacks in the pre-registration stage. CAESAR’s course registration process is not conducive to how most students want to visualize their schedule, said Weinberg junior Moritz Gellner, a member of the development team. The website puts each class the user looks at on a calendar to view and alerts users if there is a time conflict before adding subsequent classes to their lists. The developers started working on the website at the beginning of the quarter as a class project and have spent upwards of nine to ten hours a week on it since. The team encourages users to submit any problems they find while using the website. Some students have been impressed with the website and readily giving feedback. Weinberg sophomore Augustine Santillan made a few suggestions for the site after using it to search for his classes. Weinberg sophomore Alex Krule agrees that Courseseek is a great concept and would benefit from a few added features. While the developers are spending most of their time trying to fix the bugs users have brought to their attention, some members of the team plan to make new additions to the website in the future. Although the website is still functioning as an alpha version, it has reached a maximum of 80 to 90 visitors at one time. Students have been promoting Courseseek via social media, encouraging others to experiment with it.